A-HOTEL.com - Luxury and cheap accommodation in Udarnik, Russia. Prices and hotel, apartment booking in Udarnik and surrounding. Situated 2.2 km from Volzhskiy Bus Station in Volzhskiy, Apartment on Prospekt Lenina 20 offers accommodation with a kitchenette. Situated in the town of Volzhskiy, a 10-minute drive from the Volgograd-Akhtuba basin recreational zone, this modern high-rise hotel offers an on-site restaurant, a well-appointed gym and business centre. All rooms and suites at the Akhtuba Hotel are come equipped with a bathroom and toilet. 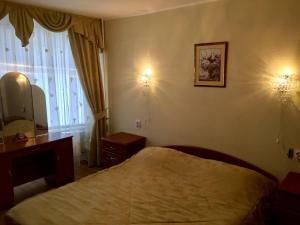 Apartment Na Lenina offers accommodation in Volzhskiy, 5 km from Volzhskiy Bus Station. Guests may enjoy the free WiFi. Situated in Volzhskiy, 5 km from Volzhskiy Bus Station and 4.2 km from Volzhskiy Art Gallery, Apartment on Profsouzov offers air-conditioned accommodation with a balcony and free WiFi. Квартира is situated in Volzhskiy and offers a garden and a terrace. This apartment offers a bar as well as free WiFi. Featuring free WiFi, Mini-hotel Solnechnaya offers accommodation in Volzhskiy, 21 km from Volgograd. Free private parking is available on site. Situated in Volzhskiy, 5 km from Volzhskiy Bus Station and 4.3 km from Volzhskiy Art Gallery, НаСуточки Апартаменты на площади Труда offers free WiFi. Located in Volzhskiy, 5 km from Volzhskiy Bus Station and 4.4 km from Volzhskiy Art Gallery, Apartment on Pushkina 84 offers free WiFi. Located in Volzhskiy, within 6 km of Volzhskiy Bus Station, Apartment on Druzhby is an accommodation offering city views. Guests staying at this apartment have access to a fully equipped kitchen and a balcony.